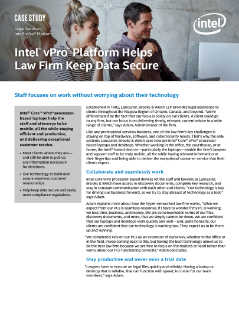 PCs based on Intel® vPro™ platform help employees at the law firm - Lancaster, Brooks & Welch LLP, stay productive & secure. Power guard rail policy helps control systems to reduce power consumption and prevent server shutdowns. Get support across OEM vendors, remote central access, easy integration, and simpler wiring. See increased rack density benefits with real-time rack provisioning in Intel® Data Center Manager. Reduce costs and improve capacity planning and thermal profiles with Intel® Data Center Manager. Discover savings and real-time data collection without deploying costly infrastructure.